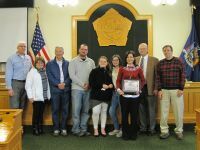 New inductees were honored Friday, April 12, at the Oswego Men's and Women's Bowling Hall of Fame Banquet at the Oswego Elk's Lodge, West Fifth and Bridge streets. The 2013 inductees were Gene Crane, Joe Falcetti, Don Turner Sr., Helen Avallone, Jennifer Wilson and Ptaricia Whaley. Also recognized at the induction banquet were Youth Bowlers of the Year, Jim Rose and Kaitlyn Grant. For images from the event, scroll down to image gallery.